management.It allows you to do more using fewer processes and ultimately spend more time growing your business. Cin7 can be integrated with various appswhich allows you to consolidate your business systems, reduce your data entry and give you a single end-to end view of your supply chain. 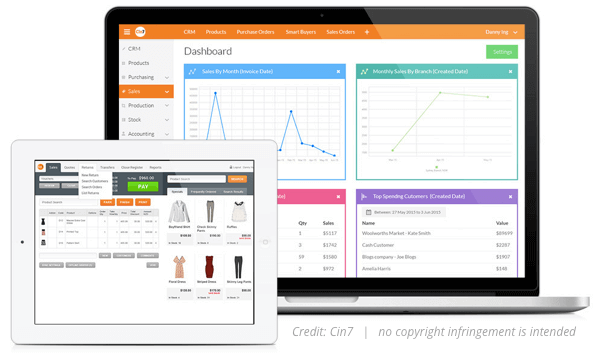 You can track inventory in real-time and reduce the number of SKUs, Cin7 makes complex retail simple by connecting to all your channels and enables you to cut down on admin and spend more time growing your business. HOW CAN REALM DIGITAL GET YOU STARTED? Realm Digital is Cin7 Integration Partner. We are able to help get your business up and running on this system that is changing the game when it comes to inventory management. We understand that the retail industry is evolving, and customers are looking for seamless omnichannel experience. Businesses are able to provide that seamless experience by becoming more efficient. The Cin7 inventory management solution allows for just that. We would love to get you started on this journey, get in touch with us today.